If you consider yourself as a real fan of Pokemon, then you must have at least heard of the very popular Pokemon ROM hack called Pokemon Light Platinum! Pokemon Light Platinum is an excellent ROM hack based on Pokemon Ruby Version and has many new features including some Generation IV Pokemon. The ROM hack was created by username WesleyFG and features many things! Play the game and experience a new Pokemon adventure! Pokemon Light Platinum is an online GBA game that you can play at Emulator Online. This free Game Boy Advance game is the United States of America region version for the USA. 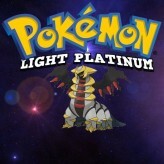 Pokemon Light Platinum is a single title from the many strategy games, fighting games and pokemon games offered for this console. If you enjoyed playing this, then you can find similar games in the gba games category. Pokemon Light Platinum game is from the various retro games on the site, and there are more games like this, including Pokemon X and Y, Pokemon Light Rising and Pokemon Platinum Version.